It was nearly a year ago that it seemed the coaching carousel Pitt football had been riding caused the program to hit rock bottom. In the inaugural contest of the 2012 season, Youngstown State, a Football Championship Subdivision (formerly 1-AA) team, rode a bus down I-79 and took it to the Panthers in their own backyard, in a 31-17 beat down. Rookie head coach Paul Chryst had suspended six players before that game, which was delayed by lightning. It was a day of disappointment that lived in infamy for many Panthers faithful. It was, perhaps, a microcosm of what the program had been through the past few years, traveling down the tunnels of conference unpredictability, player discipline issues, and a revolving door to the head coach’s office. Stuck in a dying conference, unable to keep a head coach and struggling on the field, the program had become a mixed up mess. But one thing in sports that good coaches know—something that Chryst knows—is that losing creates a certain perception. And perception becomes reality to the media and fans alike. It’s easy to say that a few more conference wins over the years and a couple of extra appearances outside the BBVA Compass Bowl would have quenched the thirst of those that were unhappy with the direction of the program. Many alumni and boosters, including College Football Hall of Famer Bill Fralic, spoke out against the athletic director Steve Pederson in January 2011 after head coach Dave Wannstedt was let go despite leading Pitt to its best three-year run in three decades. It didn’t help that the top-25 recruiting class Wannstedt amassed in 2009 was almost entirely dismantled after his firing. The Todd Graham debacle is well documented, as the flashy offensive-minded coach met Pitt at the altar but left just months after the honeymoon. 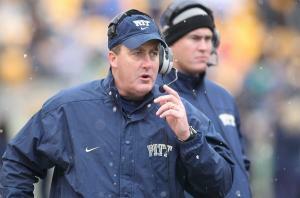 Including replacement coaches for bowl games, Pitt went through six coaches in the three years from 2010 to 2012. Only five players from Graham’s only recruiting class in 2011 remain on the roster, including potential starting quarterback Chad Voytik. Chryst steps into his second year at Pitt still cleaning up and rebuilding from that three-year tailspin. The former Wisconsin offensive coordinator is not only looking to provide the program with continuity and improvement, but to fine-tune and bring stability to some of his own coaching philosophies as well. Several players from Chryst’s first season won’t get that same chance. Three players, starting safety Eric Williams, reserve tight end Drew Carswell and reserve defensive tackle Khaynin Mosley-Smith were in a house in Oakland when police and SWAT team members made a massive drug bust. Carswell and Williams were kicked off the team and Mosley-Smith is suspended for the season. Tra’von Chapman, ranked the No. 12 dual-threat quarterback in the country according to Rivals.com, was also suspended indefinitely after an April arrest in his native Ohio. Additionally, receiver Ronald Jones was suspended for the year on the eve of training camp and starting linebacker Todd Thomas abruptly quit the team after practicing with the second unit on the first day of drills. But the big story of the offseason was hometown mega-recruit Rushel Shell, once thought to be the next premier running back of the Pitt program to follow in the footsteps of Ray Graham, Dion Lewis and LeSean McCoy, having a change of heart about transferring to UCLA and attempting to re-join the program. In what can be viewed as his own statement on the emphasis of team stability, Chryst pulled Shell’s admission ticket, and instead of jumping back on the ship, the talented running back found himself alone on the dock while it sailed away without him. The ones that remain on that ship, according to senior first-team All-Big East defensive tackle Aaron Donald, have become a tight-knit group. Chryst needs players like Donald to step forward and take control of the locker room, as he puts the onus mostly on the players to get the job done. No matter who was most responsible for the wins, Chryst earned his college victory first two weeks after the Youngstown State embarrassment. Pitt treated its skeptics to a surprise upset of then-No.13 Virginia Tech, providing some hope that the perception of stability might not be far away. Pitt finished their 2012 se ason bowl bound, three of their next four losses being by a touchdown or less. It will be different for the Panthers this year, in the Atlantic Coast Conference, which will likely present more competitive challenges than the Big East had to offer. When you hit rock bottom, there is nowhere to go but up. If the improvement Chryst and his team showed last year continues, the Panthers may finally be able to start talking more about winning conferences and less about mere stability.